Gold bullion bars are, by volume, the most popular physical gold investment in the world. Central banks buy and sell 100s of tons of gold bullion bars each year, and other entities – large banks, institutional investing firms and jewelry–makers, for example – drive the gold bullion market. 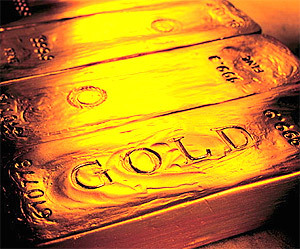 Household investors such as yourself may benefit from owning a few gold bullion bars but Gold–Bullion.org recommends that you delay your buying until you know all the facts surrounding the radiant yellow metal that goes from the earth through mining equipment, refineries and manufacturers to end up in tidy shapes that range from the size of a stamp to a massive brick. Why would an organization that promotes gold bullion bars want you to delay your purchase of that very asset? The answer has to do with knowledge, or a lack thereof. Bullion’s popularity has soared since 2001 when the gold spot price was $252. An ounce of gold bought for $252 in 2001 is now worth 500% more, but misinformation surrounding gold has increased, too. Hot topics related to gold bullion bars include the discussion about gold bullion confiscation. Will it happen? When could it happen? Why might gold be confiscated? Which types of gold would be vulnerable? Does comparing and contrasting circumstances surrounding the original seizure to today’s economic environment reveal anything useful? These questions are hotly debated among investors, dealers and analysts. Counterfeit gold bullion bars are a growing problem in our industry. Do you know any, some or all of the 8 easiest ways to determine if what you hold in your hands is genuine gold through –and –through? Most people don’t have the first clue about testing the authenticity of a piece of gold, outside of seeing if tooth marks can be left (NOT recommended) or going to a professional assayer (NOT necessary). Does the brand of bullion matter? After all, gold is just an element, and a commodity. How important is the manufacturer’s hallmark? Buying gold bullion bars overseas or from relatively new, un–tested companies could leave you with your pockets turned inside –out and your hand slapping your forehead. There is a reason serious investors almost never consider penny stocks, and the same logic applies when preparing for a gold bullion purchase. Gold bullion bars can be a profitable and safe way to store your wealth, but only if certain precautions are taken to safeguard you from unnecessary risks. After all, gold investing is risky enough without the added problems of illegal gold, fake gold and gold that isn ’t 99.9% pure. We are proud to be a nationwide discount supplier of Credit–Suisse, Engelhard, Johnson –Matthey, Ohio Precious Metals, PAMP–Suisse and Royal Canadian Mint gold bullion bars and we encourage serious investors to consider Gold –Bullion.org as the source for all of their gold bullion needs. Our Gold Investment Guide is a good place to start for learning more about the gold bullion market, as it covers the aforementioned issues and more, and we encourage all investors to grab a complimentary electronic or hard copy via the box below or by calling us toll –free so we can verify your mailing address. There are no strings attached, and you will never receive spam or unwanted sales calls. Enjoy!